Another day, another preamp based on a staple in classic American recording, right? Well, not so fast. The folks at Meris understand the market is fairly saturated (unintentional pun) and have set themselves apart with their own rendition, stocked with quite a few more bells and whistles than your run-of-the-mill 500 series preamp. 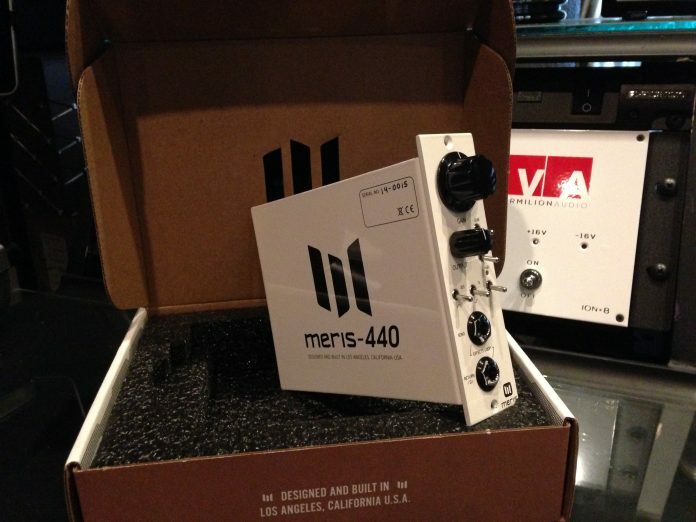 The Meris 440 comes equipped with Cinemag input and output transformers, giving you that classic punch, with both weight and open top end. 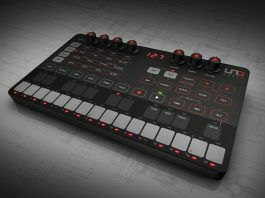 It features both an input and output knob, allowing you to push that Cinemag input transformer and taper off the output. This gives you the option of a clean or heavily colored signal. Believe me, you can push this preamp pretty hard with 60dB of gain at the input stage. If that’s too much, you’re given a -20dB pad for the kick drums and phase switch for the stereo signals. 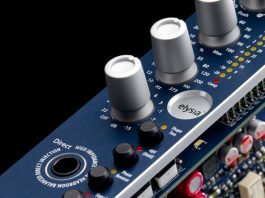 Sure, Meris could have stopped there and given you a very high quality 500 series preamp that would become a go-to; but when you have other 500 series preamps with similar components $100 cheaper, you have to get creative. 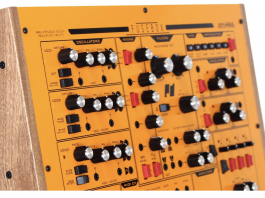 The result is pretty impressive, coming with a selectable 12dB per octave hipass filter at either 80Hz or 200Hz, selectable 4Khz or 7Khz 3db shelf EQ, and to top it all off, an effects loop that is located right in between the transformer sections. You can even use just the return jack of the effects loop as a D.I, taking full advantage of the 12 dB gain of the Cinemag transformer. The preamp comes in a very sleek white finish in great packaging. It pairs well with other 500 series units both in aesthetics and in sonics. (Disclaimer: we at Everything Recording will always pick sound quality and performance over looks but you know you like it when you have a 500 series rack that doesn’t have crazy clashing colors between your units.) You can tell a lot of care was put into the 440, even down to the logo printed on the inside part of the unit, something you would only see when installing it because you’re not going to want to take this one out of the rack. For all of the extras this pre packs, the layout on the front isn’t too crowded at all. Everything is easily located and labeled as well. I just wish there were some form of LEDs showing incoming signal. It just makes it a little easier to glance at the preamp especially when you’re using a patch panel. Just a small gripe in an otherwise great unit. 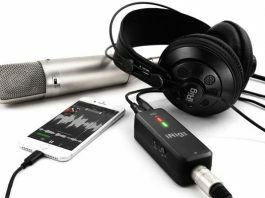 The quick guide that comes in the box is pretty much all you’ll need, even if you’re new to recording, with great diagrams and easy to understand terms. So if you can’t already tell, the 440 is a guitarist’s dream pre, allowing you to either re-amp with effects or a nice boost before your guitar hits the amp. Effects loops in guitar amps provide nice tucked delays and full reverbs, allowing the best parts of your amp to cut through; but effects loops in a preamp also allow for creative tomfoolery by giving your synths, vocals, or anything you can think of full use of your pedal board or outboard effects. So far, I’ve run a few synths into the 440 and even ran a TC Helicon into the vocal track for some great FX. 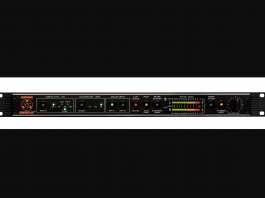 This gives your preamp front-end access to patch in effects quickly and efficiently. You will soon be using guitar delays on vocals, trust me it’s really fun. Versatility is definitely a strong suit in this preamp, working stellar on vocals, acoustic guitar, and especially bass drum. I pretty must left the shelf EQ on at all times because it adds a great presence that is not overbearing, making my DAW have to work a lot less. Having a choice between different hipass frequencies is great for cutting the mud out of guitars with the 200Hz or just removing rumble, using 80Hz. I love the almost finished texture the 440 gives straight out of the box. It really takes the work out of tracking and lightens the workload of mixing. Tracks just sit well in the mix with the 440 no matter what you’re recording. I could write you tons of paragraphs explaining how great this preamp is, but why not just let you hear for yourself. I tracked every instrument through the Meris 440 on the song below. There are no external processing or EQ on any of the guitars. 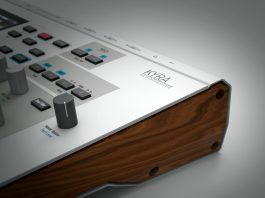 The only exception is the virtual instrument piano was run back into the 440 from Pro Tools with a Kush Audio UBK Compressor armed on the track. This gave me a chance to push the input on the 440 to breakup and give the piano some saturation.